ELEVEN SPORTS is a global sports broadcaster delivering premium domestic and international sports and lifestyle related entertainment with 24/7 channels, multiscreen and in HD. The multi-channel international broadcaster was founded in 2015 and is currently available across three continents to over 70 million households in Belgium, Italy, Luxembourg, Poland, Portugal, Singapore, Taiwan, and the USA. 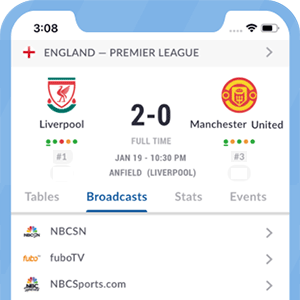 In the USA, ELEVEN SPORTS is still building up their portfolio focusing primarily on emerging sports as well as mainstream sports content that is not widely available. The ELEVEN SPORTS’s international channels includes LIVE and EXCLUSIVE coverage of the Premier League, La Liga, Bundesliga, Serie A, NBA, NFL, Formula 1, ATP Tennis and scintillating action from many other sports including MMA, Darts, Badminton, T20 Cricket, Speedway and Baseball. *Got itLive Soccer TV does not provide ELEVEN SPORTS USA live streaming. The information provided on this page is simply ELEVEN SPORTS USA soccer TV schedule.